Public seating design - “Separation and Connection” connect furniture with space, explored the connection and separation of space to create furniture that inspire interactions. 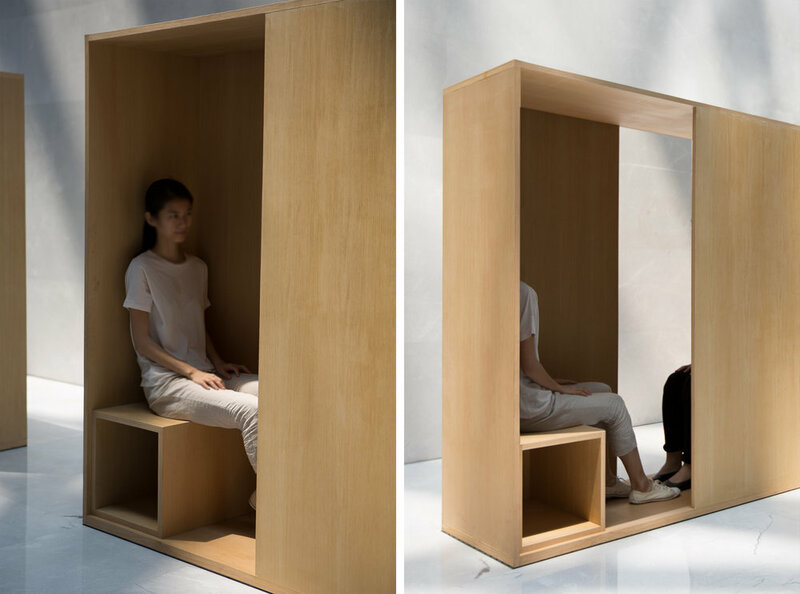 The design was exhibited during the 2018 Shenzhen Design Week, to offer the people a place to rest. 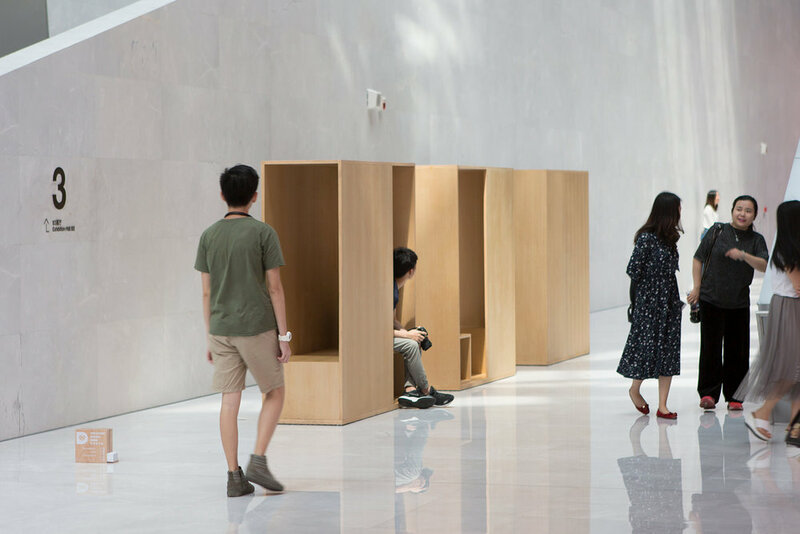 While enjoying the interesting exhibitions, people can enjoy the moment of sitting. People often choose to check their phones in their spare times. The rich information on our phones make us feel a sense of involvement to the world. On the other hand, being connected to a virtual world also makes us more and more separated from the people standing next to us , our inner selves, and the current moment. 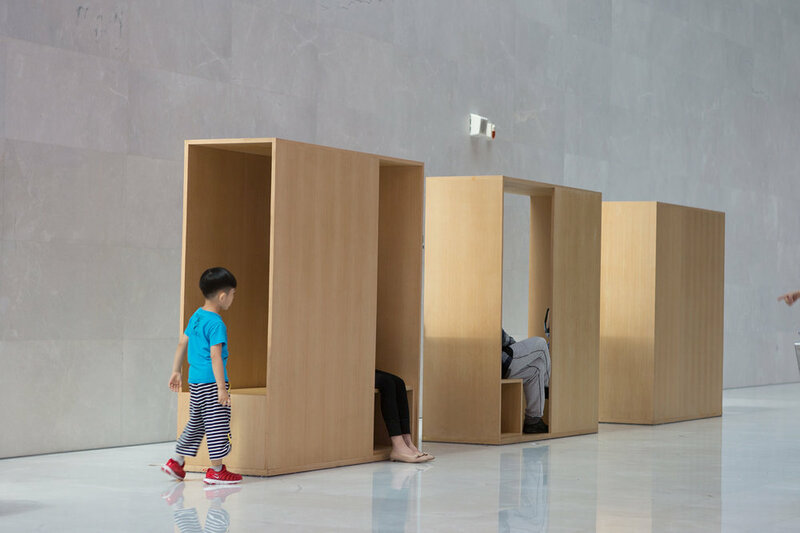 “Separation and Connection” is a set of public seating design which seeks to provide another viewpoint on public seating and inspire people to notice more about themselves and the surroundings. The three seating spaces tell different stories - Separating people from the surroundings let us concentrate on the moment of oneself; Separating the distance between people makes us more aware of the surroundings; Connecting people yet keep them at a distance makes us more willing to know about each other. 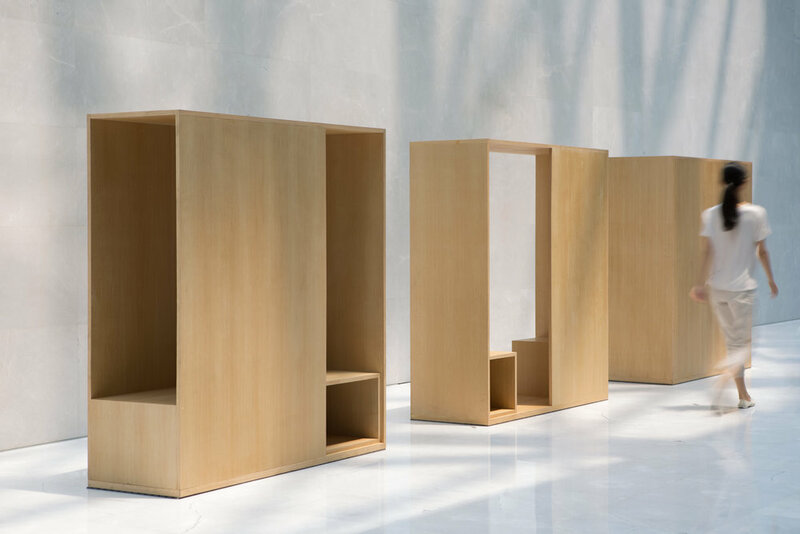 The designs blurred the conventional understanding of "furniture" and try to give more space for the seaters to create the seating experience themselves. People could choose to sit alone, face to face with friends, or separately as strangers. This seating design is a seating for two person. The two people are facing different directions while sitting on the same seat. The screen on the front separated the two seat to create private spaces, while gives the people a sense of connection with each other. In this scenario, the two people will not have communications with each other, but they will be fully aware of the other people. The conflict between constraint and connection encourage people to be aware of the surroundings with our feelings and senses. Connecting the space of the seating but separating the seats encourage people to be more aware of each other. This seating design is a seating for two person. Connecting the space between the two seaters create a "private space" in public space for conversations. From one side, we can only see one seat, but as we turn around, we can slowly discover the other seat hiding behind the half screen. 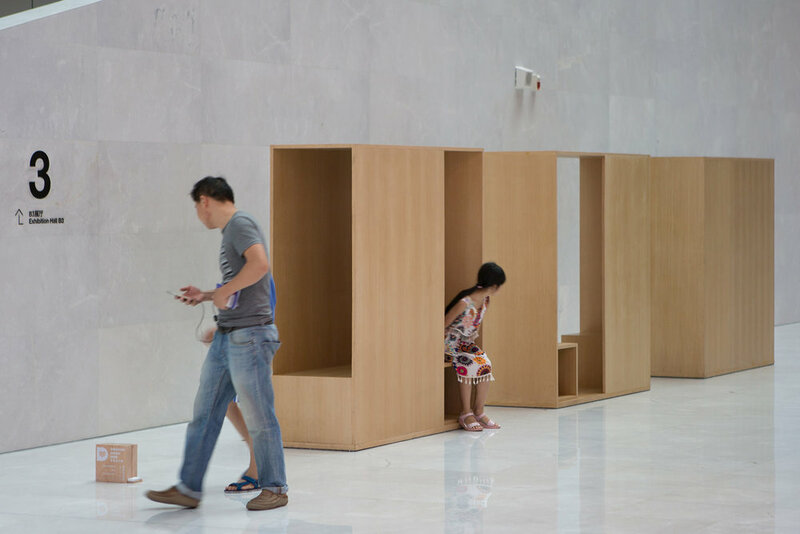 It seems like an individual space, but it is actually a space for two people. People who don’t know each other could sit facing opposite directions, and in this scenario the half screens create a private room for each people while linking them together at the same time. 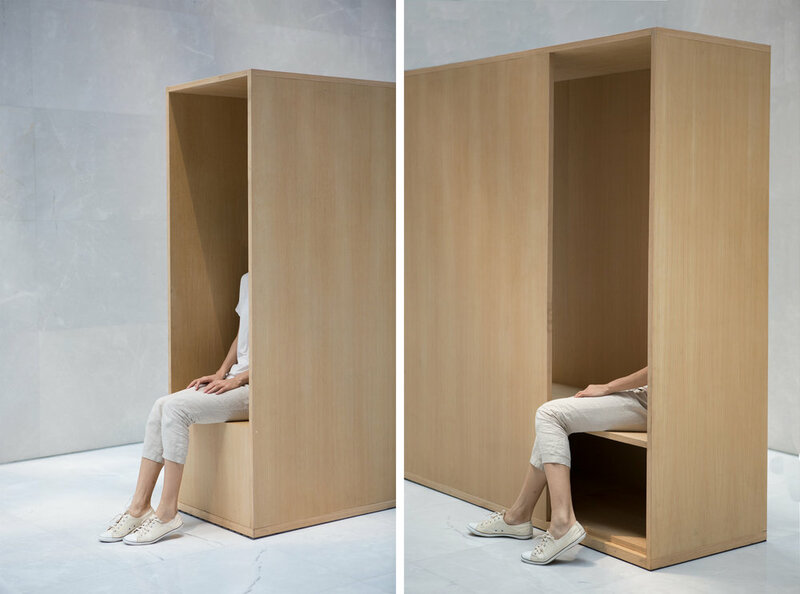 This seating design is a seating for one person. 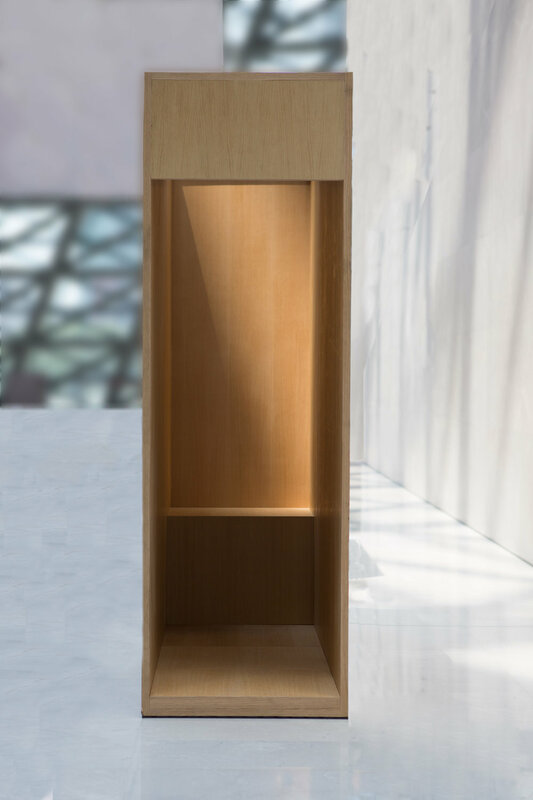 The semi-open space insures privacy and security, while gives openings on the top and front to a sense of connection to the environment. The “entrance“ side of the space creates semi private space that a person have to bow to get in. The top of the private seating has a cut to receive light, creating an ambient environment. 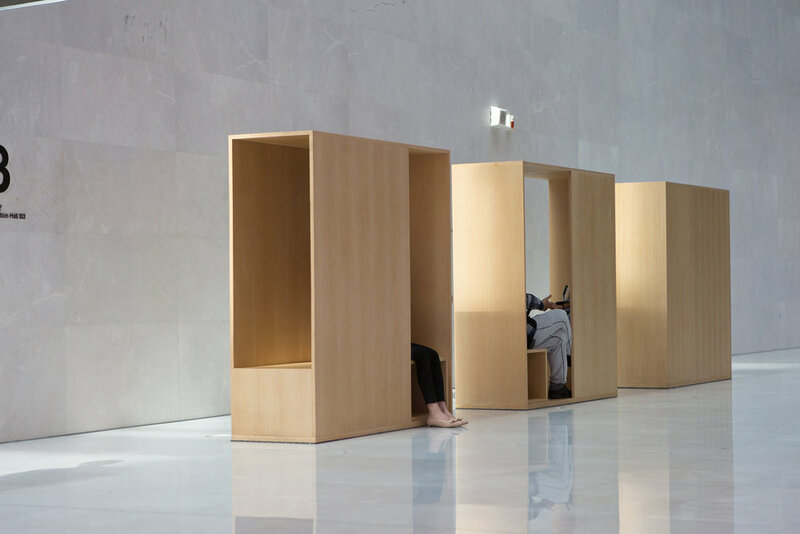 The design tries to create a seating space for people be with oneself while not entirely cut off from the surroundings.